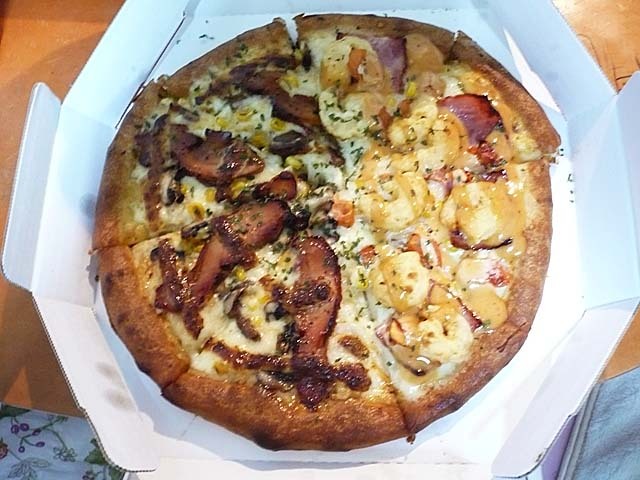 Japanese pizza delivery shops have Japanese original pizza as well as Italian pizza. 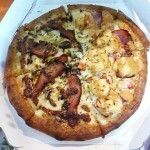 Teriyaki Chicken Pizza has chicken teriyaki, mayonnaise, mushroom, cone, onion, parsley, with dried seaweed topping, which comes in a small pouch. Shrimp Mayonnaise Pizza has shrimp flitter, garlic mayonnaise, diced tomato, bacon, cone, onion, parsley and chopped garlic. Both are delicious and voluminous enough to full one’s stomach (at least mine (^_^)).